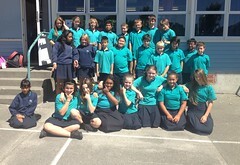 We are a fabulous class of learners from Tawa Intermediate in Wellington, New Zealand. Our teacher is Stephanie Thompson. Our class made a submission to the Education and Science select committee Inquiry into 21st century learning environments and digital learning. The class decided to make a video submission on YouTube. We hope that the committee enjoys our submission and that we change some MPs minds about learning. Well done room 15! I am very impressed with your select committee submission. Hey great vid! What fantastic citizens you all are! Well done on your creative mode to share the message. Losing someone close too you. Novel Study-James and the Giant Peach. Our Amazing Room 15 students! Room 15 @ TIS by http://tisthompson.blogspot.com/ is licensed under a Creative Commons Attribution-ShareAlike 3.0 Unported License.